Do you work at Wagamama? What did you think of Wagamama? Difficult to choose between this corner and the bigger asian plaza style opposite - guess - this might be a demonstration of differences. And beyond the tradiional style chinese restuarants often described Han or Phoenix that encourage groups. Between this and the immigration centre, there's also the immaculate department store sushi roundabout< >can't miss if you take the inside walk towards bull and rotunda, once decorated a la birds nest in sympathetic pr collusions? Get the book to use the fresh markets and supermarkets in the area and perhaps fall over some genuine cultural interests for yourself. I must add there is a time lapse since I last visited, before following the canal etc. Wagamama has been a big hit since it launched in London in the 90s. 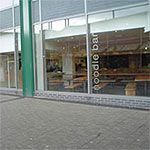 A take on Japanese ramen noodle bars, featuring simple, good-value, pan-Asian food, now it’s an international chain; so is it still good or have the noodles gone to pot? Wagamama is part of the excellent new Bullring development. Walk down Edgbaston Street and you will find a flight of steps heading towards the market and St Martin’s Church with its Burne-Jones windows. The spectacular space-age silver Selfridges building is to your left, and the wagamama restaurant, to the right, is pure contemporary steel and glass. Inside, the only places to sit are long wooden tables and benches, where you rub shoulders, quite literally, with whoever else is eating when you are. A few modish neutral colours offer some contrast with the grey tiles and that’s it for decor. One word to describe it? Minimalist. It’d be hard to feel out of place here. There are gaggles of shoppers, couples canoodling over their noodles and business singletons buried in broadsheets. If you haven’t been before, it’s worth knowing some of the wagamama quirks. The staff are armed with hand held computers that beam your order to the open plan kitchen. You are served as soon as the dish is ready, so you may get served before your fellow diners. Don’t wait; they serve it straight away for a reason. The staff also scribble numbers on your paper placemat so dishes don’t go astray. Despite being busy, all the staff are pleasant, brisk and very well informed about the food. And nothing is too much trouble, if you want that dish with rice instead of noodles or without the tofu – no problem. Noodles are at the core of the menu, though there are rice dishes, curries, salads and side dishes. Order wagamama raman £7.60 (try saying that after a few flasks of saki) and you get a large bowl of delicately balanced miso and noodles with vibrant, verdant seasonal veggies, mushrooms, fish, chicken, fish roll, prawn, seaweed, pickled bamboo shoots and mushrooms. Each ingredient retains the integrity of flavour and texture but the whole is harmonious. If chilli squid is on the specials menu, order it. Despite looking like fish in Twizzler form, it is a perfectly cooked dish (not always easy with squid) that you could pay much, much more for in swankier restaurants. The wine list is modern, nicely described and listed by grape varietals that most people will recognise. They range from £11.80-£17. There is sake or plum wine if you want the full Japanese experience, or a selection of Japanese and Asian beers (Asahi is a popular choice), along with a good choice of fresh juices and soft drinks. A nice touch is free green tea with your meal if you ask. You could eat well here and come away with change from a tenner, or splurge out and still come away feeling positive about the health of your body and your bank balance.